A Remembrance Day ceremony was held at City Hall to honour the achievements and sacrifices of those who served our country in times of war and peace. The service was led by the Commanding Officer of the Loyal Edmonton Regiment. On Remembrance Day, Albertans were invited to mark the 100th anniversary of the signing of the WWI Armistice. Attendees experienced the “Piling of the Drums” tribute ceremony and honour guard, they were also able to leave a message of peace at the John McCrae Poppy Labyrinth, see the Lord Strathcona’s Horse (Royal Canadians) and take in the many exhibits. Remembrance Day 2018 marked the 100th anniversary of the Armistice that ended what history knows as the First World War. Edmontonians served and sacrificed themselves for our nation in that conflict. We have built this virtual cenotaph to pay tribute to Edmontonians who gave their lives in the First World War and to their families, some of whose names (and even Edmonton neighbourhoods) have thankfully not been lost in the passage of time. The names of the soldiers you see are drawn from official Commonwealth War Graves Commission documents and supplied by Veterans Affairs Canada. The list is not complete, but the video you are watching does provide a compelling experience in pixels of the price paid by Edmontonians. 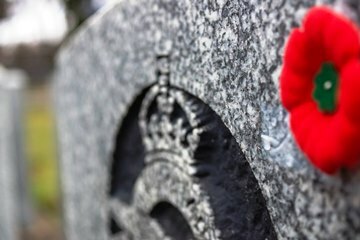 A registry to honour and remember the sacrifices of the more than 118,000 Canadians and Newfoundlanders who, since Confederation, have given their lives serving in uniform.